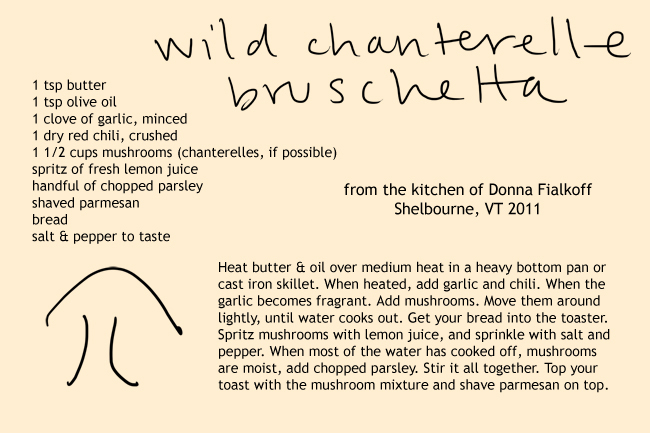 This entry was posted in Cooking by Heart and tagged bruschetta, chanterelle, daughter, forage, foraging, forest, fungus, mother, mushrooms, vegetarian, vermont. Bookmark the permalink. the simplicity of the ingredients here is pretty remarkable. i don’t think i’ve ever cooked with chanterelles, so my curiosity is especially sparked. another nice job, a&p!